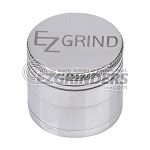 The Extra Small Ergo Grinder 4 Piece is a heavy duty herb grinder that is CNC machined from a solid block of aircraft grade aluminum that goes through an anodizing process to create an extremely durable grinder that is highly resistant to chipping and scratching. 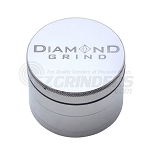 Ergo Grinders feature an ergonomic lid design that is coupled with a micro-ribbed grip to offer a simple to use operation that makes grinding through a chamber full of material as easy as can be, requiring very little pressure. 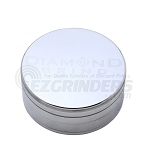 Within the 4 part Ergo grinder you will find a set of the strongest magnets available holding the top two layers, this helps to ensure that none of your material will escape if the grinder is dropped. After passing through the grinding chamber your herb will sit above a stainless steel sifting screen that will filter any pollen that falls from your material down to the bottom storage compartment. This innovative sifting screen can actually be removed unlike many other grinders in it's class, held together by three magnets it can be quickly and easily be detached by just using two fingers for a simple cleaning process. Ergo includes a standard mesh screen but offers two other types of screens that can be purchased separately to customize your pollen collection, including silk for a finer grain and coarse for filtering a larger sift quality. 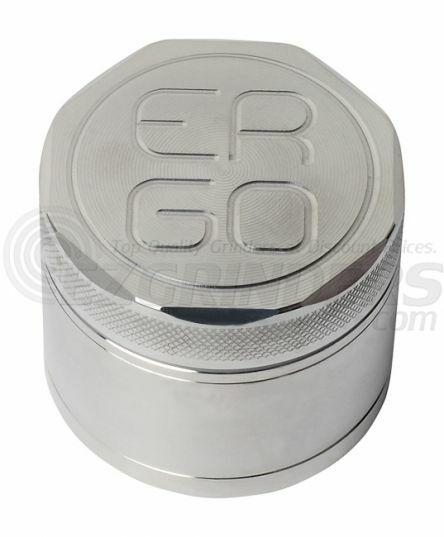 Ergo's Extra Small Grinder measures with a diameter of about 2" or 50mm, leaving you with a pocket-friendly piece that is still big enough to grind and storage plenty of material.